Axial Piston Pump, Swashplate Disign, Variable displacement pump, Disigned for hydrostatics transmission for open circuits. Flow is proportional to input speed and displacement, and is infinitely variable adjustment of the swashplate. 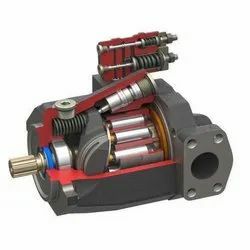 Fixed Displacement Pump A4FO is an axial piston pump of swashplate disign for use in open circuits. Outflow flow is Proportional to the drive speed. Looking for Huade Piston Pumps & Valves ?